I have many people to thank for their support of 100 Years in the Life. I am grateful, too, to Lise Rubarth, for the design of this website and to all the women and girls who gave me the chance to be their storycatcher. 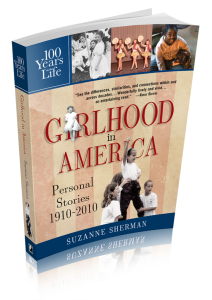 Here's your chance to submit your own story for possible publication in one of the upcoming books in the 100 Years in the Life series or for this blog. Not a writer? Pitch your story idea here. I can write it for you!